Central column: Top: View from Chateau de Quéribus, Pyrenees, France, looking north. What appears to be a folded layer is in fact a sequence of planar limestones that dip towards the south (towards you) and are transected by river valleys (photo by M. Schöpfer). Centre: Box fold within greywackes at Clogherhead, north of Dublin (photo by H.-P. Steyrer). Bottom: Plunging fold (the fold is plunging towards you) from Loughshinny, North Dublin, Ireland. The fold hinge exhibits a bend, stepping to the right (photo by M. Schöpfer). Left and right column: Matlab generated 3D diagrams illustrating structure contours of various geologic structures (blue, transparent surfaces) that intersect a simple topography (shown in shades from green to yellow). Topographic contours are shown as black curves, structure contours are white and the outcrop pattern, which is projected at the base of each diagram, is plotted in red. For further details see article by M. Schöpfer in this issue. The Bachelor of Science in Geology degree is offered by nearly 300 universities and colleges in the United States. The curriculum of these degree programs is composed of three parts: core required and elective geology courses, cognate science requirements, and general education requirements. Analysis of the frequency of inclusion of courses in the required core has lead to the identification of four curricular patterns common to geology departments. Conversely, there is much more commonality in the cognate science requirements nationally in that two semesters of chemistry, physics, and calculus are required by two thirds of all Bachelor of Science programs. The structure and organization of general education requirements vary significantly as do the number of required credit hours embedded in the general education program. 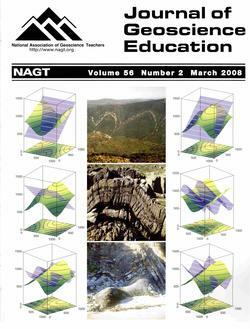 Analysis of the Bachelor of Science in Geology degree serves two important purposes: first, it provides a database upon which informed discussions of curricular content and accreditation standards can be made; second, it provides departments undergoing program review a basis for comparison with other institutions and national norms. The creation of an educational geologic display at the Lake Havasu City campus of Mohave Community College was accomplished by collecting boulder-sized specimens of representative rock types that occur within the boundaries of Mohave County, Arizona. The intent of the display is to offer students something more comprehensive than hand specimens, to inform residents and visitors of the county's geologic diversity and history as well as to provide curriculum opportunities for K-14 in geology. Forty-nine boulders typifying rock types of the Basin and Range, the Colorado Plateau, and the Colorado River extensional corridor are labeled with a rock description and a map of the collection locality. An informative geologic timeline incorporated with the Colorado Plateau display and more in-depth information on the college's science website provide students and citizens with a good introduction to various concepts in geology. These components, accompanied by biological, environmental, and meteorological campus displays and by similar information on the website, are part of a growing program to promote natural science within the county. The concepts of total stress, effective stress, and fluid pressure are important to understanding where water comes from when producing water from a confined aquifer system. However, the overall conceptual image of pumping confined aquifers is difficult for many students to grasp, because pore space is not drained, but rather water is produced as a function of the water and aquifer compressibilities. I present a simple, inexpensive demonstration, which can be used to help students visualize the interplay between stresses and fluid pressure when pumping a confined aquifer, and can be incorporated into a standard class period of an introductory hydrogeology class. This exercise uses a juice container as a simple analog for a confined pore space, and demonstrates how a decrease in fluid pressure from pumping causes an increase in effective stress assuming a constant total stress, potentially leading to subsidence. Spacecraft-collected remotely sensed datasets provide an excellent vehicle for illustrating and conveying geologic principles and scientific reasoning to students. A particularly useful dataset includes synthetic aperture radar (SAR) imagery from NASA's Magellan mission to Venus. To help illustrate this dataset's usefulness in amplifying geoscience lessons, this paper serves as a virtual field trip guide to three Venusian field areas; each region displays geologic relations that provide ideal settings to address fundamental geologic principles and practice scientific reasoning. The images are available online at no cost through the USGS webpage, map-a-planet. Specific class exercises are limitless and easily integrated into petrology/volcanology, geomorphology, structure, field methods, and introductory courses. Further, Venus' extreme surface conditions (~450° C, ~100 bars surface pressure) add a unique twist in geologic studies and emphasize the universality of fundamental geologic principles. Structure contours are one of the most important concepts of geological maps, but students often find it difficult to visualize them in three dimensions (3D). A simple Matlab script is presented, which is intended to assist students in the visualization of structure contours in 3D. The currently available versions of the script produce displays of the following types of geological structures: (i) Planes, (ii) sinusoidal folds, (iii) box- and chevron folds, and (iv) folds exhibiting parasitic folding. For simplicity the Earth's surface is defined using simple cosine functions, whilst structures iii and iv are defined using simplified Fourier series. The script is based on a three-step process: (i) Define the topography, (ii) define the geological structure and (iii) establish whether the geological structure is above (eroded) or below the Earth's surface. The last step provides the outcrop pattern. The topography and geology are displayed in 3D and the associated map pattern is plotted in the same diagram. This combination of 3D and 2D plotting provides a direct link between the 3D nature of the structure and its 2D projection (i.e. the map). The 3D diagrams generated with the script have been used successfully in undergraduate geology mapping exercises. In a nationwide graduate paleontology class of teachers taught entirely online, students (N=36) were required to apply their content knowledge in a self-selected local field area through collection and identification of a small number of fossil specimens. As a secondary requirement, teachers were required to develop an educational activity for their own middle or secondary students using the specimens they procured. This informal field research replaced a traditional laboratory assignment and provided students with opportunities for local field work. Although modification of online interactions was required, students were able to successfully identify local field collection sites with instructor guidance and individualized communication. Students also successfully applied their knowledge through the development of activities for their own classrooms. Approximately 86% of students scored higher in the hands-on fieldwork activity than in previous traditional laboratory assignments. In an anonymous survey, students stated that the application exercise was not more difficult when assigned in an online format. Our exploratory study results indicate that autonomous geoscience fieldwork activities are possible in an online graduate course setting. AGI estimates that 275,000 physical geology text books are sold in the United States per year. We selected 15 texts from nine different publishers. Data was collected from photos with scientists. Gender data was divided into male, female, and unknown. We noted if the individual was Caucasian, African-American, Asian, Latino, or unknown. Of the 307 geologists in the figures, 214 are male (69.7%), 61 are female (19.9%), and 32 are of undeterminable gender (10.4%). Out of 214 males, 168 are Caucasian (78.5%), 9 are racially diverse (4.2%), and 37 are unknown (17.3%). Out of 61 females, 51 are Caucasian (83.6%), 4 are racially diverse (6.6%), and 6 are unknown (9.8%). The books portray males as 3.5 times more likely to be geologists compared to females. This ratio significantly exceeds the current proportion of men and women entering the workforce (58% male and 42% female for B.S. degrees in Earth science) or the near equal proportions in the U.S. population. The books imply that Caucasian geologists are 15 times more abundant in the work force compared to their non-white peers. This ratio differs significantly from the data for recent graduates and the general U.S. population (about 3:1 for both data sets). This study assesses an extra-credit weather forecasting contest offered in three different introductory meteorology courses, each consisting of a different student population: general education (Gen. Ed.) students, geology majors, and graduate students. Five semesters of data were collected, amounting to 15 Gen. Ed. sections (423 students), three majors sections (66 students), and one graduate class (16 students). Student participation in this optional contest is dependent on class level, ranging from 40% for Gen. Ed. students to 90% at the graduate level. Student responses indicate the primary reason for lack of participation is forgetfulness, with discouragement second. Scatterplots of final course grade versus final contest ranking indicate - to a statistically significant (> 99.5%) degree - those Gen. Ed. and majors students who do well academically will also do well in the contest. No statistical significance exists between course grade and contest ranking for graduate students. A quantitative assessment of student learning reveals that student forecasts improve relative to computer model output as the semester progresses. When averaged over all courses and semesters, the improvement is statistically significant at the 95% level. As a result of the increased experience that is acquired through contest participation, student forecasts - which initially have greater error when compared to corresponding model forecasts - have comparatively less error by semester's end. By constructing "treatment" and "control" groups from existing grade rolls of courses taught with Just-in-Time Teaching (JiTT) method and traditional lecturing in recent years, this study demonstrates that JiTT improves student performance in classes. First, two groups of students were selected from each of the four different courses taught with JiTT such that the "treatment" group regularly completed warm-up exercises whereas the "control" group did not, but both groups had similar first exam scores. Statistical t-tests show that the "treatment" group had significantly higher overall course grade (by one letter grade on average) than the "control" group. Second, statistical t-test also indicates that students' relative improvement between the last and the first exams in a general education course using JiTT method is significantly higher than that of the same course using traditional lecturing prior to adopting JiTT method. In addition, qualitative surveys of students demonstrate that the majority of the students thought that doing Warm-Up exercises helped their learning, because Warm-Ups made them think about the material before going into lecture and thus made them more aware of and keen to the topics that would be discussed. These consistent results in four different courses over five semesters indicate that JiTT improves students' performance. The modified Hele-Shaw cell lets us simulate sedimentation in a wide variety of situations from a river bed to a sedimentary basin. It illustrates deposition and erosion, stratigraphy, progradation, aggradation, and the origin of sedimentary structures such as beds, laminations, ripples and slumps. Using a narrow acrylic tank based on the Hele-Shaw cell, sediment and water are added at one end and water is withdrawn at the other. As observers watch sedimentary processes in real-time, sediments build up in layers in the tank, demonstrating the nature of strata as a geological record. This engaging experiment is suitable for primary to university education. It has principally been used to teach the fundamentals, but can also be used by advanced students to experiment with other sediment-water interactions such as groundwater flow and angle of repose. Alaska's students directly observe their high-latitude landscape changing in response to both active tectonics and warming temperatures. Alaska's secondary school teachers must increasingly provide Earth systems science education that integrates these personal observations with geospatial datasets and satellite images using Geographic Information System (GIS) technology. Alaskan job opportunities requiring Earth science and GIS training are increasing, yet less than 1% of Alaska's university students choose geosciencerelated majors. The EDGE (Experiential Discoveries in Geoscience Education) program provides a year of Earth science college courses, geologic field experiences, GIS instruction, and technical support for groups of Alaskan high and middle school teachers and their students. Since 2005 EDGE has increased the Earth science content knowledge and GIS and computer skills of 34 Alaskan teachers and facilitated the transfer of their knowledge and skills into Alaska's science classrooms. More than 500 middle school students have learned GIS from EDGE teachers and 30 EDGE high school students have conducted original research utilizing GIS related to landscape change and its impacts on their own communities. Long-term EDGE goals include improving student performance on the newly implemented (2007) 10th grade standards-based science test scores, recruiting first-generation college students, and increasing the number of Earth science majors in the University of Alaska system. More information on EDGE programs is available at http://www.edge.alaska.edu.